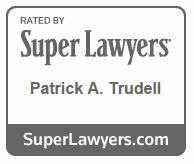 Pat Trudell is a personal injury lawyer practicing in King and Snohomish Counties. He has been arbitrating and trying cases since 1986. Pat is a successful trial lawyer with a proven track record. Insurance companies and defense lawyers know Pat Trudell says what he means and means what he says. Pat will give the insurance company a chance to arrive at fairness. If this cannot be done he will file your case and take it through trial. Justice is being treated fairly. Fairness is what you deserve. Pat Trudell stands for your right to justice through negotiation, mediation, arbitration and trial. A good attorney is what makes the difference.